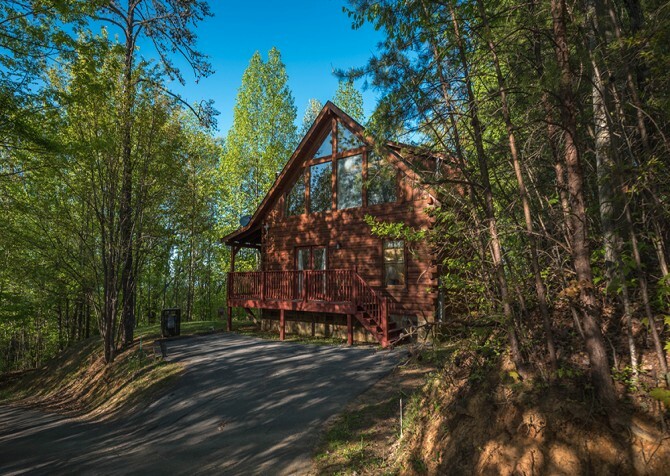 No worries in sight, only the beautiful city of Gatlinburg and gorgeous forestry are in view from the covered deck of your charming mountain cabin nestled among the pines. With 1 bedroom plus a loft and 2 bathrooms, comfortably escape to the Smokies with 6 friends or enjoy a quiet retreat with your special someone. 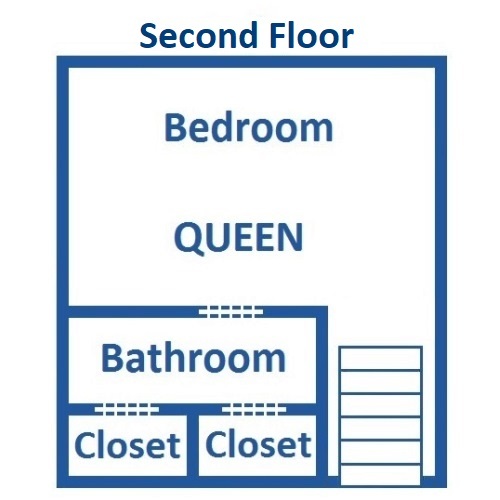 The open concept of the common room areas creates a flowy, homey atmosphere, much better than cold, boring hotel rooms. Kick back with a good book while lounging on the couch with dreamy natural light pouring in from high loft windows during relaxing afternoons. Your fully loaded kitchen makes cooking and cleanup convenient, perfect for a tranquil, budget-friendly getaway to the mountains or putting together a picnic lunch to take to Cades Cove. Dine in the moonlight at the charming wooden table while a romantic fire sways in the stone fireplace. After a restful night’s sleep in your king and queen-size beds, venture to downtown Gatlinburg with the family, under 1 mile from the cabin, and explore the many attractions, restaurants, and shops of the Smoky Mountains. Once you have wandered through the interactive and highly entertaining Guinness World Record Museum and played arcade games at Fanny Farkle’s with the kids all afternoon, stop by Big Daddy’s Pizzeria for takeout and host a fun cabin movie night on the large flatscreen TV in the living room! 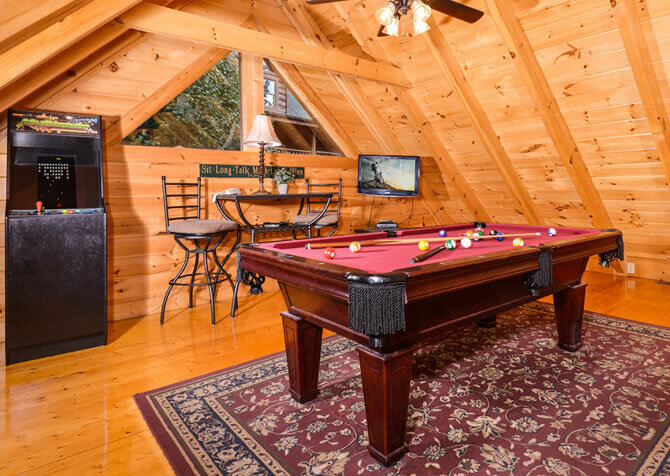 Visit the Smoky Mountain Winery to pick up a bottle of your favorite wine before enjoying a romantic night in the cabin while soaking in the large indoor jetted tub or flirting over a competitive game of pool or foosball in the cabin. After scenic hikes through the mountains, wash dirty clothes in the convenient washer and dryer, toast to another anniversary while relaxing on the covered deck, and look out over the magical city of Gatlinburg in the night after another peaceful day well spent in The Vinson. The large, cushy leather couch is a prime afternoon napping spot after a fun day exploring the area. Kick back with your morning news on the large flatscreen TV while sipping on a hot cup of coffee and listening to the birds sing just outside the windows. On clear, cool evenings, snuggle on the couch while soft flames dance in the gas fireplace and the stars peek through the trees outside. Mountain-motif décor and open views to the surrounding forestry will leave you in a dreamy state while your cup of tea cools on the wood coffee table. Cook breakfast, lunch, and dinner with the help of a charming fully loaded kitchen stocked with cooking tools, dishes, cups, and utensils! Meal preparations, making sandwiches for a picnic lunch at Andrews Bald, and cutting vegetables for a delicious dinner are easy with plenty of counter space. Store groceries and cold dessert wines in the full-size refrigerator, where there is room for your tasty leftovers from The Peddler Steakhouse. Start your mornings in the lovely sunlight with a warm cup of joe from the coffeemaker or a fruit smoothie fresh from the blender. Don’t skip cooking because of the cleanup; the dishwasher takes care of the work! You are always close to nature in The Vinson! Sip on your morning coffee at the quaint 4-chair dining set while the birds sing and the trees dance in the breeze right outside the window. Your board and card games from home are perfect to play on the dining room table after clearing plates from a delicious dinner. Laugh, bond, and make memories at the table while sharing a romantic anniversary dinner catered to your cabin with Savory Solutions or a laid-back family dinner with the kids. Find all the comforts of home under the cozy covers of your king-size bed while watching TV or reading a book before falling asleep. Make yourself at home and unpack your suitcases in the tall dresser before lying down for nap under the soft breeze of the ceiling fan after your trip to the cabin. The cozy room filled with natural wood textures and soft natural light invites you in while leaving your stresses at the door. Wake up to the tranquility of the Smokies right outside your window before stepping directly into the bathroom for a quick shower or a quiet bath in the jetted tub. Sneak away to the loft bedroom for some truly peaceful moments reading in the rocking chair and resting on the queen-size bed in the sunlight while other guests play in the living room. Mountain forest views rest through large windows, creating the perfect spot for afternoon napping. 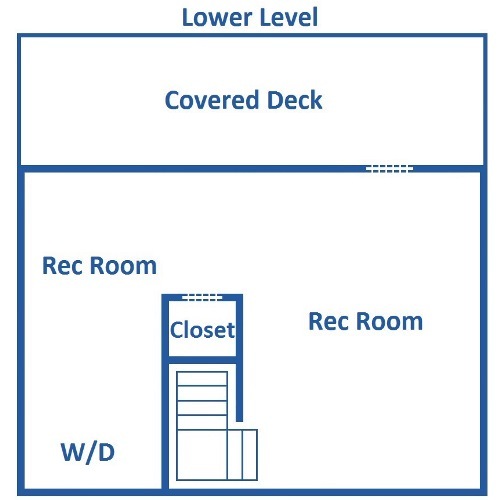 The lower level will be the hangout spot during downtime and rainy days with plenty of fun to entertain! 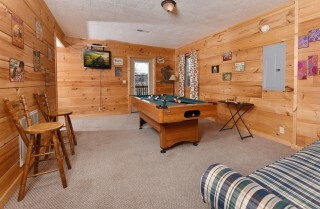 Shoot some pool while sipping a 6-pack of local beer and watching your favorite team play on the brand-new 75-inch TV. Play a strategic game of chess while relaxing and sipping glasses of local wine you picked up along the Rocky Top Wine Trail. 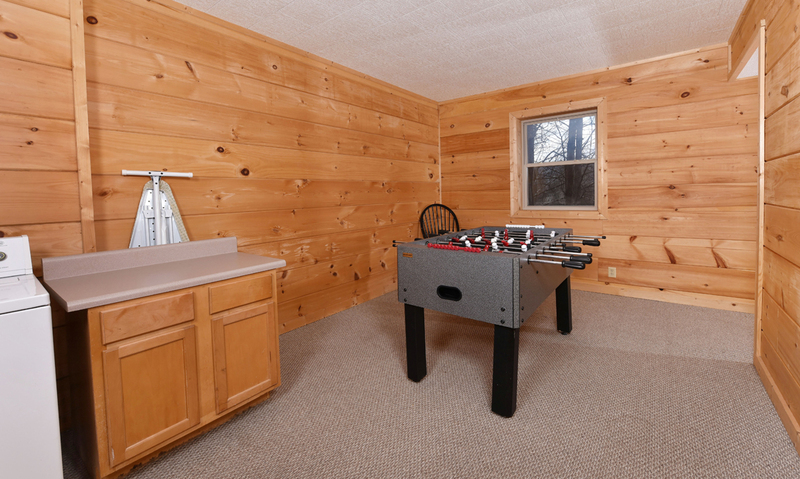 Challenge the kids to a game of foosball before dinner – loser clears the table and loads the dishwasher! Kill some time working on trick shots on the pool table before grabbing your map of downtown of Gatlinburg and touring the shops as the sun sets below the surrounding mountains. *New sound system coming in March 2019! 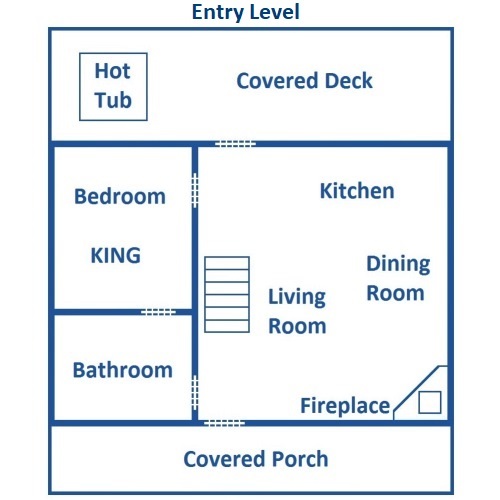 Enter a Smoky Mountain daydream through the back doors leading to the deck. 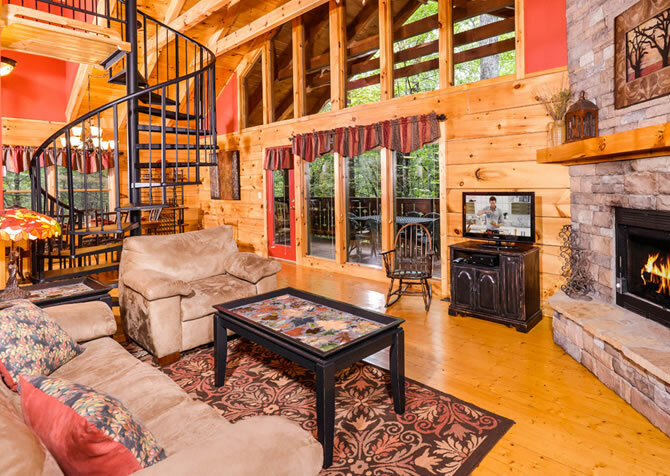 Settle into cushioned seats while sipping on ice-cold sweet tea and gazing across Gatlinburg through the trees on a peaceful, sunny afternoon. Slip into the therapeutic waters of the bubbly hot tub to unwind in the evenings or start your morning with warm bubbles and cool, crisp mountain air. Lean back in the rocking chair on the deck as the burgers cook on the charcoal grill. Spend time just soaking up as much sunshine and fresh air as you can during your vacation in the Smokies! Discover prime skiing in the beautiful mountaintop resort of Ober Gatlinburg! Home to indoor ice skating, incredible views, and a mall, during the winter season Ober offers skiing, snowboarding, and snowtubing! 10 slopes varying in difficulty, and classes make Ober a great spot for seasoned skiers and beginners. With hundreds of miles of trails in the Smoky Mountains, where do you begin? Let the hiking guides of A Walk in the Woods, featured in Southern Living, walk you through an incredible educational hike! Choose your excursion by difficulty and length, and begin exploring the beauty of the Smokies! The sweet smell of the famous Ogle Dogs will lead you to the bright carnival-like arcade center of Fannie Farkle’s, where the fair comes back to life! Play Skeeball and tons of other arcade games to help your little ones earn tickets or impress you special someone the old-fashioned way! 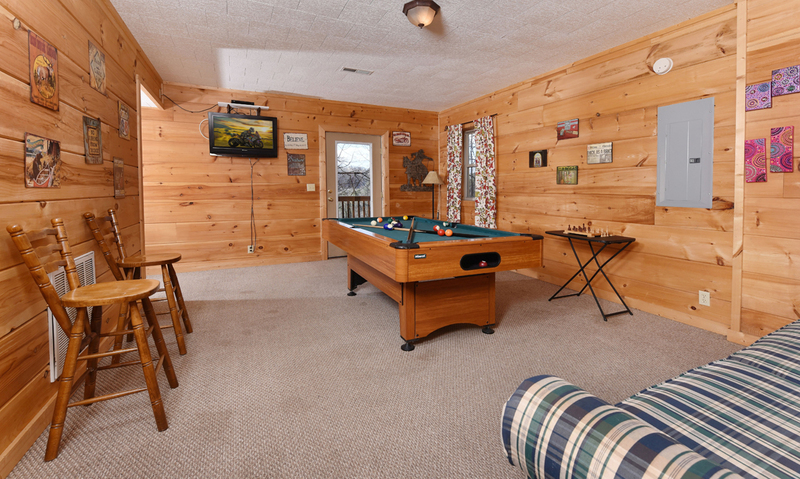 "This cabin was so amazing with my family. I love the view of downtown from the back porch. The cabin was super clean and cozy!! It was sweet them leaving us with a little goodie bag. Even though it’s in town it’s also really private.…"
"This cabin was so amazing with my family. I love the view of downtown from the back porch. 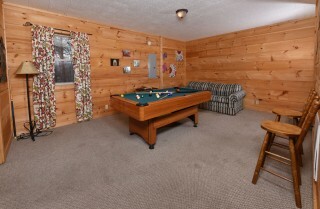 The cabin was super clean and cozy!! It was sweet them leaving us with a little goodie bag. Even though it’s in town it’s also really private. We will be renting again next fall for sure!! Ty for the memories ❤️"
We are overjoyed to hear about your amazing cabin stay at The Vinson! We're so pleased that you loved the cleanliness, coziness, and relaxing views. 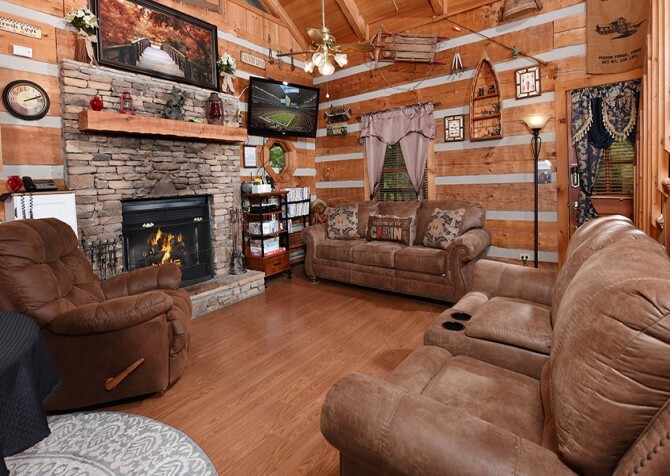 We look forward to your next memorable cabin stay in the Smokies! Thank you for being a great repeat guest! "We stayed in The Vinson back in November and we loved it!! The cabin had everything and the price was fair. Definitely coming back!" Gatlinburg BBQ Festival — Yum!